Harry Harvey Hilliard (1857 - 1941) was a sailor, manager of Clouston and Co's Blenheim wharf, a poet and an artist. 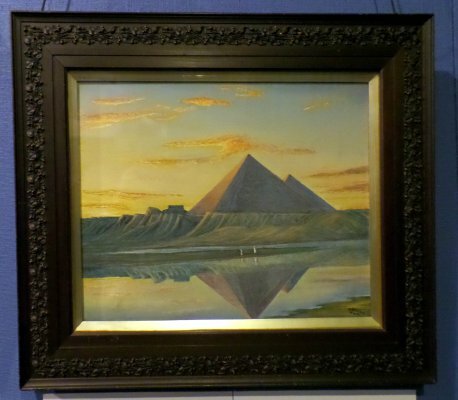 He copied this scene of the pyramid of Cheops at Giza reflected in the flooded River Nile from a well-known 1880s photograph by Frenchman Felix Bonfils. It is not one of Hilliard's better paintings but a poignant background adds layers of meaning to it. When the First World War was declared in 1914 Harry Hilliard organised the Marlborough contribution of books for soldiers of the New Zealand Expeditionary Force to read during the long sea voyages to war. His 21 year old son Jack Lockhart Hilliard volunteered and embarked from Wellington on the Orari. On arrival in Alexandria in Egypt in December 1914, Private Hilliard may have mailed a colour postcard of the pyramid image to his father and mother Susan in Alfred Street, Blenheim. Soldiers routinely sent such postcards home before proceeding to training camps near Cairo. Four months later on April 15th 1915 newspapers reported the first New Zealand death of the war in combat. A group of soldiers of the 12th Nelson Regiment Company stationed with Jack had helped repel a Turkish invasion of the nearby Suez Canal, resulting in the death of 22 year old Private William Arthur Ham. As his father Harry signed and dated this painting that day, the war must have been alarmingly close to home. The painting's dark frame decorated with trailing violets, symbols of death, mourning and resurrection, support the interpretation of this painting as a memorial to that event. It may have been one of three paintings Harry Hilliard donated shortly after to be auctioned for the Belgium Relief Fund. Ten days after this was painted Jack Hilliard landed at Gallipoli. He survived to take some of the legendary photographs of the ANZACS during that gruesome campaign. Jack exceeded expectations by serving the entire war, and return home to Blenheim with an honourable discharge in February 1919.